How does LinkedIn decide Jobs you may be interested in? I get asked this question all the time. Of course you can create your own job search criteria, but if you have not put anything into the system, how do those jobs pop up? 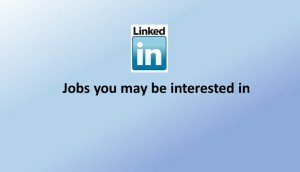 I think you can see that LinkedIn doesn’t really use a job matching algorithm. Instead, they use keyword matching. In 2014 LinkedIn acquired Bright, a job matching service, for $120 million. Once Bright’s alogerithms are fully incorporated into LinkedIn systems, maybe matching you to your ideal job will improve, but right now, here are seven steps you can take to help you connect to your next employer. Know the role you are seeking and the top five strengths and skills you need to get that role: then highlight those strengths and skills in your profile: name them in your summary, show them in your work experience. If your top skill is project management, then describe what you bring to the role in your summary, and illustrate how successful you have been in your job descriptions. Highlight your project management education and training. Make sure the right audience will find you. Make sure you get endorsed for these top five strengths and skills. You can help this process by reordering your Skills and endorsements section of your profile so they show first. Be brave and delete endorsements which don’t add weight to the image you want to portray. Think about your own values and only endorse or recommend people who you truely admire. Make sure people looking at who you have endorsed will see this as an extension of your values and ethics. Reorder your profile so activities which reflect your strength and skills are shown top. If you have just completed an MBA maybe it’s a good idea to move education to the top, with work experience under. Make sure you are connecting to people valuable to you. 500+ connections in the entertainment sector, may not be much help if you want to get a job in banking. To reach the people you need, take out a one month subscription to LI premium, and cancel as soon as you have reached the people you would like to reach. And this is the biggie! Have you noticed that the “jobs you may be interested in” section lists jobs from people in your network first? LinkedIn’s search engine bounces back vacancies from your network to you. It is also true that when people are looking for skills you have; the results of their searches show their 1st level connections first, then 2nd level connections. To get found, you need to have a wide network in the sector you want to be employed in. So if you are actively looking for a new role, don’t be passive about your LinkedIn profile. Make it work for you and grab every opportunity you can.